Oregon fan’s hopes of seeing Bralon Addison play in the 2014 season were dismantled after he tore his ACL in the spring. The Ducks were hopeful to see him make a speedy recovery and get back on the field to help his team in the ladder part of the 2014 season. However, he never returned to the field in 2014 due to a recovery process that took longer than originally expected. This upcoming season, Addison is ready to shock and awe when he makes his return for 2015. 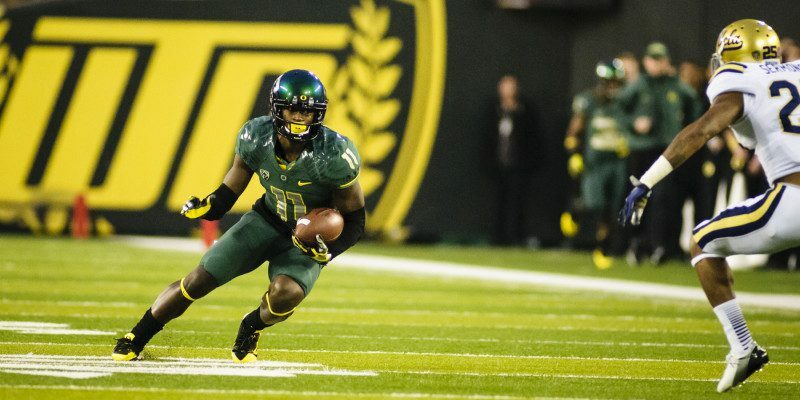 Braylon Addison stretches out to make an amazing catch against Oregon State. Addison will be a Senior this upcoming season, and will be seen as one of the offensive leaders for the Ducks. The shifty wide out turned the heads of many college football fans with his dazzling agility and elusiveness during his breakout season in 2013. The Texas native recorded 61 receptions with a total of 890 yards, averaging 14.6 yards per reception during his Sophomore year with the Ducks. Without Marcus Mariota, the Ducks will be relying on other Seniors to carry on the leadership role for offense. Aside from Addison, other returning Seniors for the offense will be Byron Marshall, B.J. Kelly, Pharaoh Brown, and Dwayne Stanford, among others. Alongside Addison, these players will hold a crucial role for the Ducks as they move forward from a loss in the National Championship game against Ohio State. If anything, Addison’s absence will have given him the fuel to emerge as one of the top leaders for the upcoming season. He has a chance to add to his impressive 1,133 career receiving yards, and his 10 career touchdowns while only playing two seasons for Oregon. Do not count Addison out, because he will yet again have another break out season in 2015 for the Ducks.